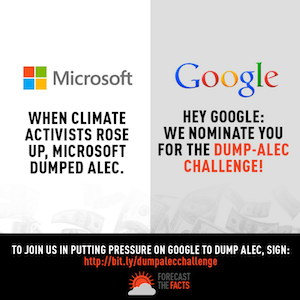 Google: Take the Dump ALEC Challenge! Immediately cease financing the American Legislative Exchange Council and pledge to never fund climate deniers again. Google's motto is "Don't Be Evil," but the company funds one of the worst climate denier groups in the world: the American Legislative Exchange Council (ALEC). The corporate-front group fights to kill renewable energy standards and says global warming is a good thing. Google has been a corporate leader in fighting climate pollution, but supporting ALEC is at cross-purposes with the company's climate change commitments. Google chairman Eric Schmidt even said, "You can lie about the effects of climate change, but eventually you'll be seen as a liar." Tell Google to live up to its "Don't be evil" motto and stop funding ALEC.